Chinese broadcaster ZRTG (Zhejiang Radio and TV Group) has opened a new television production complex in the garden city of Hangzhou, capital of the eastern province of Zhejiang. The International TV Centre houses four main TV studios, with a further two dedicated to ZRTG’s Home Shopping Channel. In a first for broadcasting in China the whole audio set-up is connected using a RAVENNA AoIP (audio over IP) network, which links several Lawo mixing consoles. ZRTG is the fourth largest TV network in China and is owned by the Zhejiang provincial government. Broadcasting 12 TV channels, including satellite service Zhejiang Television, as well as eight radio stations, Zhejiang People's Radio among them, ZRTG was formally established in 2001 and grew out of local broadcast services during the 1960s. Satellite allowed the broadcaster to grow substantially from the mid-1990s onwards to be considered a major player along side the big three Chinese broadcasters, China Central Television (CCTV), Hunan Broadcasting System (HBS), and Jiangsu Broadcasting Corporation (JSBC). Among the shows it broadcasts are reality talent contests Sing! China and Chinese Dream Show, celebrity diving competition Splash!, variety showcase Keep Running and the Mr Zhou Live Show, presented by comedian and talk host Zhou Libo. ZRTG is now running its production operations from a 42-storey building with studios for music recording and filmmaking as well as TV projects. Audio in the International TV Centre is networked using RAVENNA AoIP technology, developed by ALC NetworX. This is controlled and monitored by Lawo's VSM (Virtual Studio Manager) and marks the first full implementation of audio networking for broadcast TV studios in China. 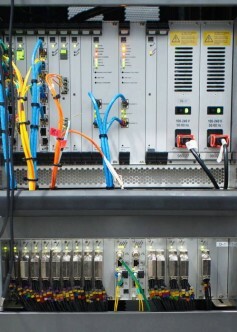 Rear view of rack used for routing in the ZRTG International TV Centre. The network relies on central routers to distribute every signal required for productions round the production centre and made available to programme makers. Routing is carried out by Lawo Nova73 systems, which connect to the sound areas of the studios over RAVENNA. The four main TV studios offer different sizes of space for differing needs and cover 2500 square metres, 1200 square metres and two 600 square metre rooms, designated A and B. 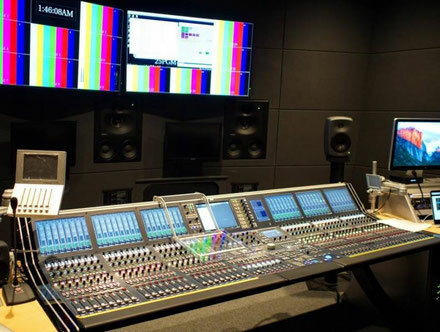 Each studio has an audio control room featuring a 56-fader Lawo mc²66 and its own Nova73 router, which connects to ten central DALLIS stage boxes through RAVENNA. The sound area for the 600A studio is also used for music recording in a 200 square metre space. To tailor it to music requirements this control room features Pro Tools HDX and Pyramix digital audio workstations, whose virtual faders can be controlled simultaneously by the mc²66 desk. A mobile Waves SoundGrid hardware and software processing system is also housed in the room and can be moved to the other studios where necessary. ZRTG is currently broadcasting the second season of vocal talent show Sing! China. It is produced using three audio control rooms: one for multitrack recording and the final mix, one for live mixing and the third as a backup. A Nova37 router is used to manage the microphones involved in this production, with each mc²66 console featuring a user interface that is used to determine which mixer has master control over the mic preamps. Two other studios - one 600 square metres, the other 250 square metres - are used for ZRTG's Home Shopping Channel. These each have a 40 channel mc²36 desk connected to a Nova37 to give access to common wireless microphones and de-embedded audio feeds. All systems integration was carried out by regular ZRTG contractor NDT. The SI will also be working on a new 4k OB truck and audio vehicle for the broadcaster. These will feature Lawo mc²66 and mc²56 consoles, EVS video recorders-servers and VSM control, all provided by NDT. Sony Professional is the chief integrator and will supply the cameras and video switchers. Coachwork is being carried out in the Netherlands and both vehicles are due to go on the road during the summer of 2018.